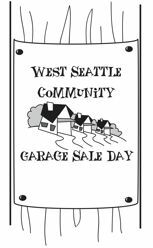 « Thanks for being part of West Seattle Community Garage Sale Day 2016! This entry was posted on March 24, 2017 at 8:39 pm	and is filed under Announcements, Registration. You can follow any responses to this entry through the RSS 2.0 feed. You can leave a response, or trackback from your own site. When I was taken to PayPal the description was still 2016 West Seattle Community Garage Sale instead of 2017. It’s says 2016 at the bottom of the page I am on now, as well.